The Old Bailey is England's most important crown court. The court can try crimes from any part of the country. It was originally established as a Session House in 1539 but was rebuilt in 1774. The Old Bailey became known as the Central Criminal Court. The building was demolished in 1902 and today the Old Bailey stands on the site of Newgate Prison. 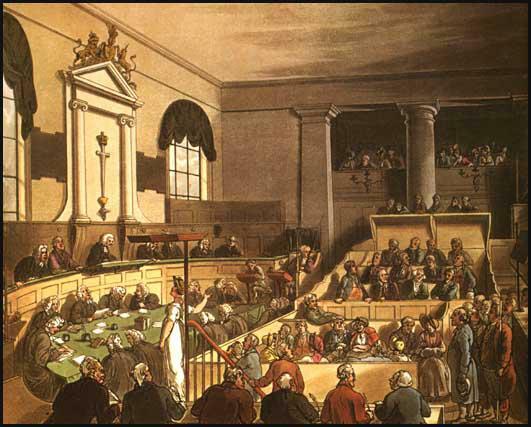 A court is held at the Old Bailey eight times a year for the trial of prisoners for crimes committed within the city of London and the county of Middlesex. The crimes tried in this court are high and petty treason, murder, felony, forgery, petty larceny, burglary, etc. The print represents the court employed in the examination of a witness.